It's really a shocking news not only for Kannada Cinema but for the state of Karantaka state. No wonder if Super Star cancel his Shivaji schedule and move immediately to Bangalore. None other leaders would have such a impact of Rajkumar on Kannadigas. In the last 50 years, he is such a legend, ruled the Kannada cinema by giving just 206 films. 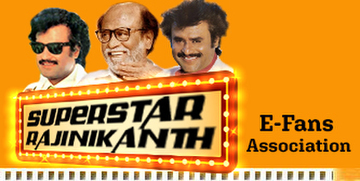 When he was completing his 100 films, Tamil cinema had seen the second generation of people like Rajni & Kamal. As concerned in Kannada cinema, Shivaji + M.G.R = Rajkumar. Being a successor, Super Star always proudly to mention Shivaji, M.G.R & Rajkumar as his forerunner. He has been keeping good contact with Rajkumar family even from 70s. He was supposed to do small villain role in Rajkumar's film. Super Star got the first appreciation from Rajkumar for his block buster movie in Kannada cinema, Andam Moola Saval in earlier 80s. 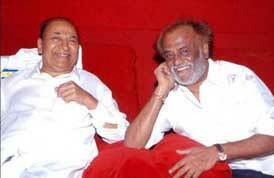 Rajkumar was a big inspiration for Rajni to make his spiritual venture, Sri Raghavendirrar. Rajni - Rajkumar friendship went a remarkable stage only after this movie. Like Rajni, Rajkumar was also creating waves on Kannada politics. To be frank, there is no opponents for Rajkumar in Karnataka. Whoever the ruling party, has to get the blessings of Rajkumar, no other way. he didn't like to taste the power! No one could forget the role of Rajni in Rajkumar kidnap case. Rajni wanted to take some initiatives to rescue Rajkumar at any cost failing it will reflect to the tamilians who settled in Bangalore. Rajni himself came forward to help the emissary sent on behalf of Tamil Nadu & Karnataka State Governement. Once he declared that he was ready enter into forest if required. It was because of Rajkumar, Rajni described Veerappan as monster which created waves among the Vanniyar community and rest of the thing we know very well. Whenever Rajkumar comes to Chennai, never forget to call up Rajni. When he was undergoing treatment in MIOT, Chennai, Rajni went there to see him which was a surprise visit even the staff of MIOT were also not expected. In the last 10 years, Rajni has become the family member of Rajkumar's family and he never missed to attend their family functions including Rajkumar family film functions. expected that much crowd for a film function. "Jooghi" had crossed only 100 days and they were celebrating in a play ground like Chepauk. Rajkumar couldn't stand in the stage. Wherever we see huge crowd, people shouting in kannada, kannadiga flag, Rajkumar stills. No other person would be getting this much honour there. Yes.. Kannadigas are identifying Rajkumar with the state of Karantaka.. they proudly say Rajkumar is the eldest brother of Kannada Ammegey! No one can replace it May his soul continue to rest on the hearts of Kannadigas!